(CNN) -- Relatives of victims of Northern Ireland's deadliest single bombing on Monday won a landmark civil case against four men they blamed for the attack in Omagh that killed 29 people. 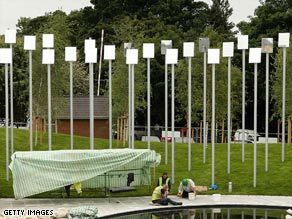 A memorial has been built for the 29 people killed and 300 injured in the Omagh bombing. Real IRA leader Michael McKevitt and three other men, Liam Campbell, Colm Murphy and Seamus Daly, were found to be responsible for the terrorist attack by a judge in a case brought by victims' families at Belfast High Court. The Real IRA was also found liable for the attack. Mr. Justice Morgan awarded damages totalling more than £1.5 million ($2.4 million) to the family members who brought the action. A court spokeswoman added that it was up to the plaintiffs to try to recover the money from the defendants. "For many, the effects are catastrophic and their lives will never be the same," the judge told the court. The relatives brought the case after the failure of the police to secure a criminal conviction over the 1998 Real IRA bombing in the County Tyrone town. The judge said it was not for the court to determine whether any criminal offense had been committed: "The role of the court is to establish whether the plaintiffs have discharged the burden of demonstrating that the defendants were responsible for causing harm to the plaintiffs in the manner alleged and, if so, to determine what, if any, damages are payable in respect of the harm proved." The blast on a busy shopping street in Omagh killed 29 people, including a woman pregnant with twins, and wounded more than 300. It occurred at the tail-end of the 30-year conflict between Roman Catholics and Protestants known as the Troubles. It was also four months after the signing of the Good Friday peace accord -- which ushered in a new era in the region despite the continuation of some fighting. The 500-pound bomb struck on a busy summer Saturday when people were out shopping on the main street in the market town. The attackers called in a bomb threat but gave police the wrong location for the bomb, leading authorities to evacuate people from the center of town to the end of the street, right where the bomb went off. The Real IRA, a dissident republican paramilitary group, claimed responsibility for the bombing. The Real IRA opposed the peace plan, which had the cooperation of the mainstream IRA, or Irish Republican Army.